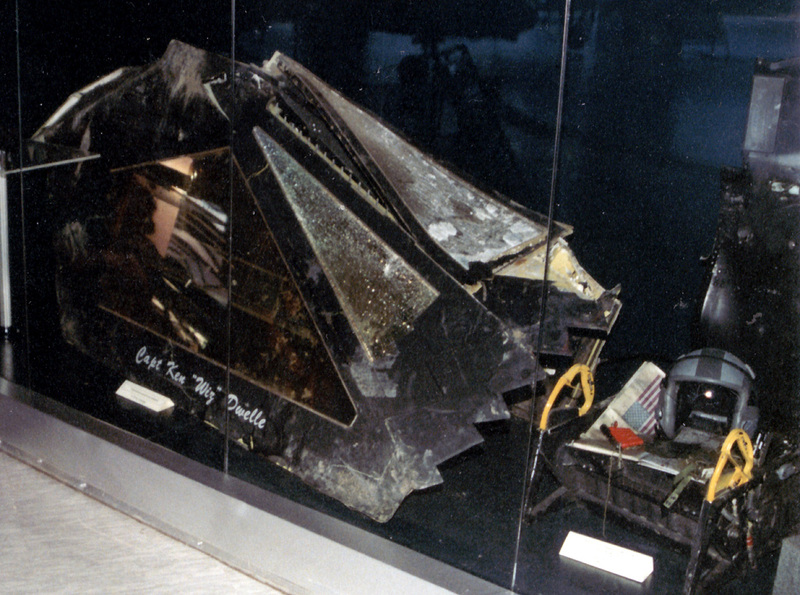 F-117A Canopy from downed jet now in a museum in Serbia. 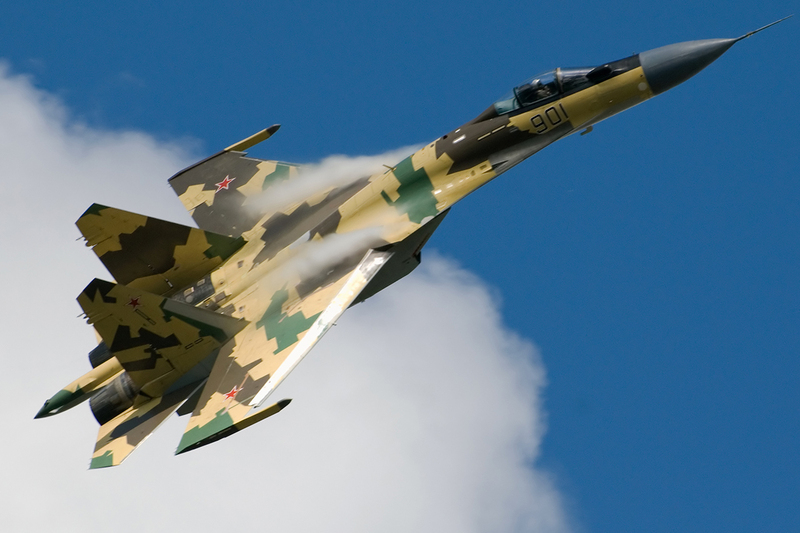 Russia is building a new Air Force around two platforms: the SU-35 and the FA PAK T-50. These two platforms are powerful and highly capable. The SU-35 exceeds the performance of the US Joint Strike Fighter F-35; the emerging T-50 is a stealth aircraft that challenges the US F-22 and may be more modern and capable. While the US no longer manufactures the F-22 and, in any case, was barred by Congress from exporting them, the Russians are exporting the SU-35 and are in negotiations to export the T-50 PAK with the first customer India. Many American allies wanted the F-22 and for good reason. It was the world’s most advanced jet, with a very high level of stealth and with considerable power thanks to its twin engines. Designed to replace the F-15 with something even more formidable, Australia, Israel and Japan wanted the F-22 to protect it from the proliferation of Russian platforms –for Japan and Australia also worry about China’s emerging stealth planes in the Pacific. China also has just bought from Russia 24 SU-35’s. These will arrive before the US JSF will appear in either Australia or Japan, and the SU-35 may perform better than the F-35. As for the F-22 the United States has 184 usable aircraft. However, the availability of the F-22 is sub-par and, under the best circumstances, only 63% of the aircraft are flyable at any one time. Plans to improve F-22 availability seem to have been either delayed or scrapped; and in any case the goal was to reach only 70%. As the F-22’s age, availability will probably decline further. Unfortunately the cancellation of the original program that projected over 400 F-22’s, the poor availability, and other issues that have plagued the aircraft compounds into a serious problem as the Russians move forward with the PAK T-50. The strategic concept of US stealth fighters is to kill opposing aircraft well beyond visual range and before the opposing aircraft can “see” them. In the US mix of F-22’s and F-35’s, the F-22’s are supposed to destroy high value targets like ground to air missiles, enemy radars and command and control centers; the F-35’s would then be used to bomb enemy forces and degrade the enemies ability to fight. To some degree the stealth “solution” followed the tactics Israel developed in Operation Mole Cricket 19 where it took out Syrian missiles and radars and then proceeded to decimate the Syrian Air Force mainly over the Bekaa Valley in 1982. The difference is that in that older conflict, Israel did not have stealth, so it made its attacking planes disappear by the use of jammers and by creating bogus targets using drones. It exploited the superiority of US F-15 and F-16 fighters in the air to air war, and deployed look down shoot down radars which the Syrians lacked. Stealth was proven on the now retired F-117A stealth fighter that was used in the Panama “war” against an inept and poorly equipped enemy; in the Balkans it performed less well, and one was shot down by the Serbians using an SA-3 missile. Two others were hit but survived. In the Iraq war the F-117 did a fair job, but its ability to hit targets accurately was only around 40%. 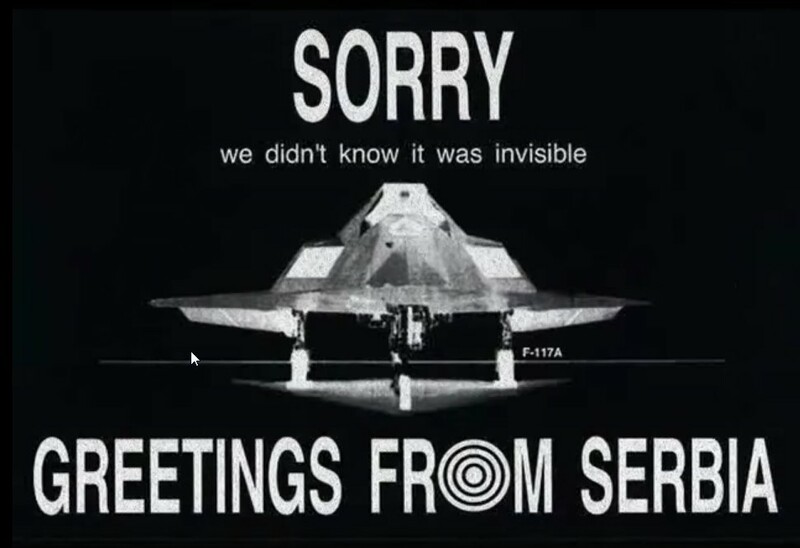 Serbia sends a message about the F-117A to the US after the shootdown. Of course the F-22 is a huge step above the subsonic F-117. But there are not enough of them and none of our allies have them because we would not export them. The savior airplane is supposed to be the F-35. The F-35 is a tactical, not a strategic airplane. It maneuvers poorly, is vulnerable from behind because its “stealth” is primarily frontal; when it opens its bomb doors it lights up radars, and its growth potential is open to question. Meanwhile the Russians have been developing jammers, new types of radars based on L-band that can detect stealthy airplanes; and advanced sensors using infra red and optical scanning. Moreover, like the US the Russians either are fielding or are about to field very long range air to air missiles, but with a significant advantage over current US systems. The reason is that the Russian planes -both the SU-35 and the T-50 fly much higher and faster than the F-35. This means that when they launch air to air missiles the missiles are flying both faster and farther than anything that the F-35 can release. Aviation experts sense that this may be enough to close the gap entirely on the US approach to beyond visual range tactics. Russia has built up a first class aviation industry and is close to producing power plants for Russian jets that are as good as anything coming from Pratt and Whitney or GE, the two main producers in the US. While there are still gaps on the Russian industrial side, the Russians have got help from European defense companies and are able to buy just about any equipment they need. The COCOM system that regulated exports to the USSR and Warsaw Pact was shut down by Bill Clinton in 1994. Since then the Russians, even during the period when they were buying almost nothing in the way of new military equipment (from the end of the Cold War in 1991 until as late as 2011), they were steadily building a new defense industry based on industrial know how and equipment that they could not get in the Cold War period. One can add to the new and more robust nature of the Russian defense industry the fact that the Russians have developed a cyber capability that has proven more than able to steal defense secrets from the US and its allies. In this one can posit, but not prove, that the Russians also benefit from Chinese espionage that follows the same principals. For its part the US has not found a way to deal with what is nowadays called the advanced persistent threat. Not only is it persistent: it is growing exponentially. But the most important aspect in Russia’s strategy is its willingness to export its front line aircraft. From the Russian point of view this is a necessity because the Russians need the money and they want the influence. There has been a lot of criticism of the F-35 and doubts as to whether it can survive on the modern battlefield if challenged by the latest Russian aircraft. Most importantly, it is a tactical airplane and our allies don’t have the F-22, which is a vital piece to being able to mount a proper challenge to Russian-made platforms. 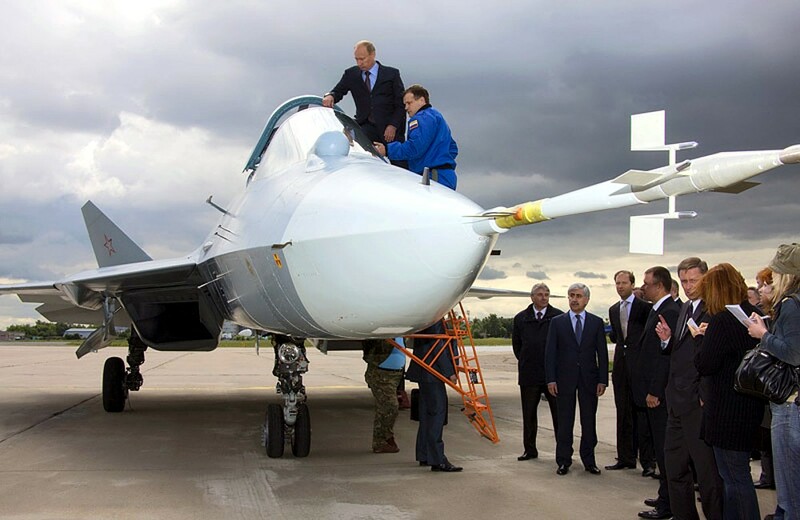 President Putin inspects the SU FA-PAK T-50 prototype. 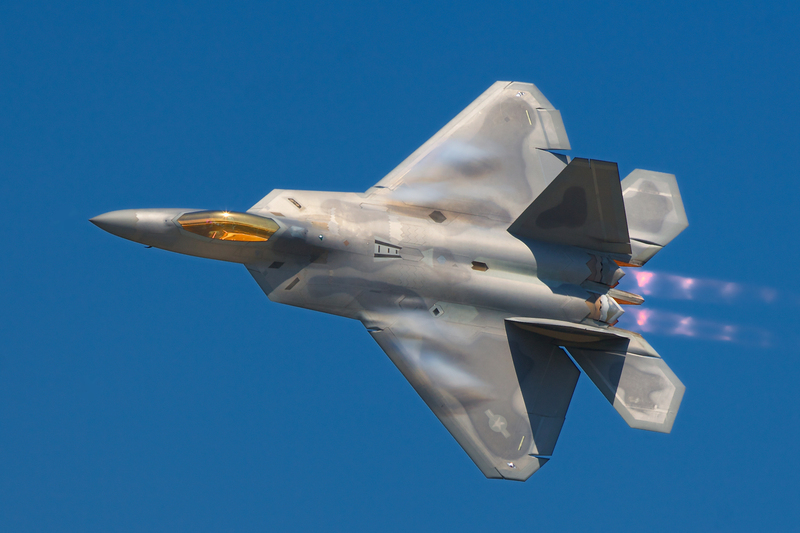 Some think manufacture of the F-22 should be revived, in the form of an improved model. But to make that approach at all viable, its exportability also needs to be reconsidered. In the current political and budget environment there is scant chance the F-22 will be reincarnated. To a degree the US is facing an uncertain future; our allies are even in a more dangerous position.